Risotto has to be one of my favourite meals of all time. 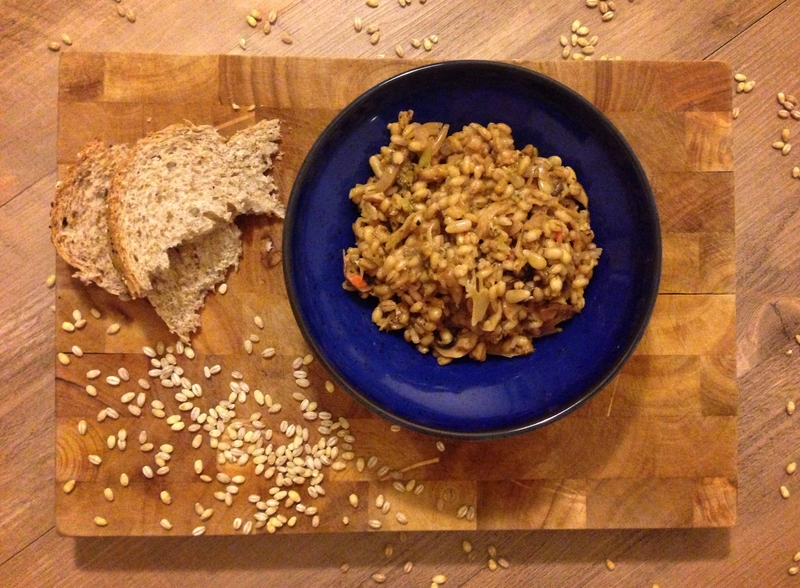 The other night I wanted to mix things up a little and experiment with pearl barley – I’d eaten this out at restaurants before but never cooked with it. After a little testing around, I nailed down the perfect recipe to get a fresh, warm and nutty flavour from the risotto. It was delicious. The great thing about pearl barely is that it’s really cheap to buy and very easy too cook with. A perfect combination! Laura and I picked up a bag of pearl barley from Waitrose earlier this week for around £1. Each serving of pearl barley will require around 60g, so a 500g bag will keep you going for a good few weeks. Preheat a pan over a medium heat and add a drop of rapeseed oil to it. 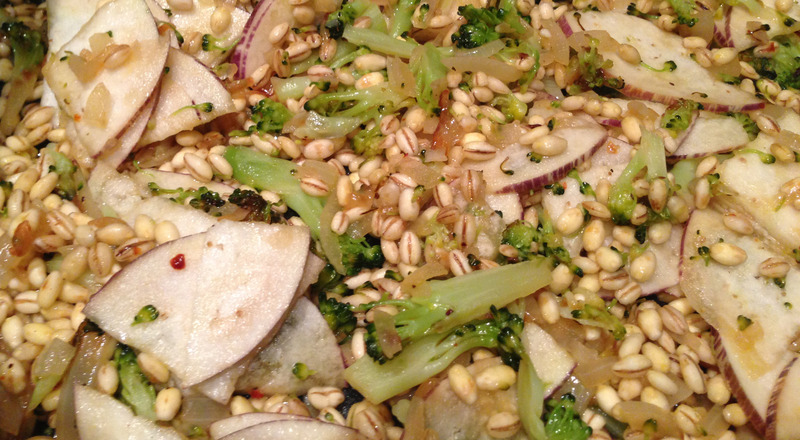 Add the diced brown onion, sliced garlic, broccoli florets and red chilli, cover the pan and leave for 2 minutes. Uncover the pan and add all of the pearl barley. Stir in the pearl barley well, ensuring that it is all coated lightly in the oil - do this for around 30 seconds. Pour in the white wine and stir the pan frequently until the white wine is nearly completely absorbed. Don't let it get too dry, there should always be a slight amount of moisture to the pan. This should take around 2-3 minutes. Turn down the heat to a medium heat and add a small amount of vegetable stock (enough to nearly cover the contents of the pan). Make sure that you're stirring the pan regularly. Add the sliced mushrooms, aubergine, pine nuts and walnuts (crush the walnuts roughly in a pestle and mortar, or just the end of a rolling pin). Now season well with salt and pepper. Keep stirring the contents of the pan and once the vegetable stock is all absorbed, add some more (so that it just covers the mixture) until all of the stock is used up (should take around 20 minutes). I never add all of the vegetable stock in one go, like other recipes do, because it makes the risotto very starchy and this loses a lot of the great texture that you can create. Add the smoked paprika and mozzarella (ripped into thin strips) and stir in until the cheese has melted. Now remove the pan from the heat and leave to sit for a minute. The pearl barley shouldn't be tough at this point, it should have a soft texture that almost resembles that of cooked rice. Serve with some crusty white bread and you're onto a winner.